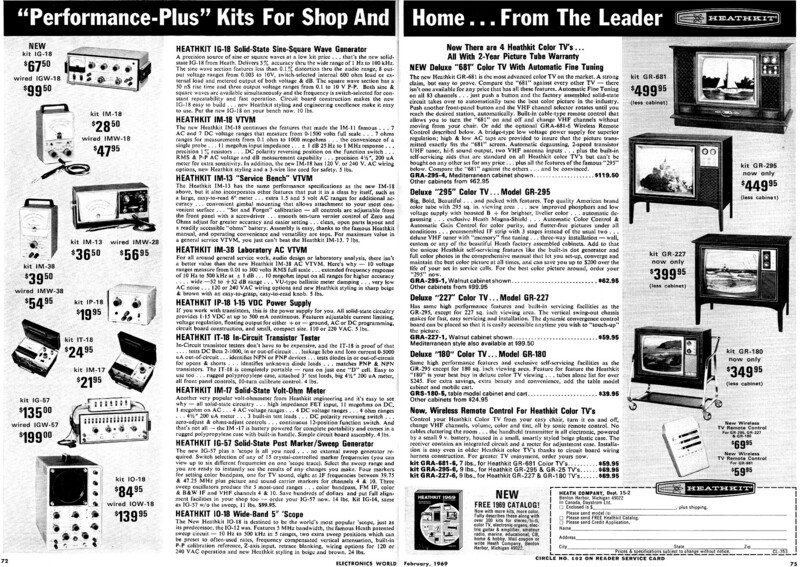 For those of us who like to wax nostalgic over our early days of building electronics kits, here is a two-page spread from Heathkit in a 1969 issue of Electronics Word magazine. 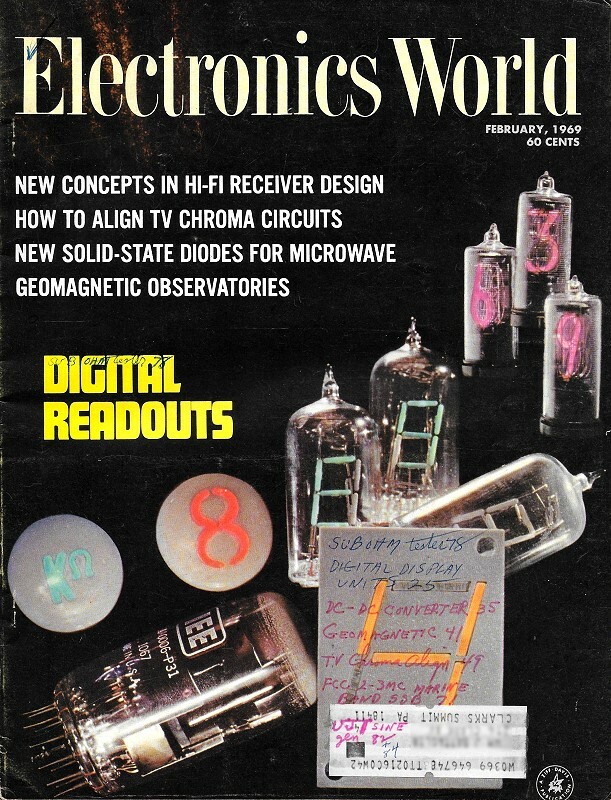 That year was pretty much at the beginning of my more serious involvement in electronics, which had spawned a few years earlier but was really kick-started after getting a "Radio Experimenter" kit for Christmas. It had parts for an AM radio with a breadboard that used springs as attachment points for the components. Being "so easy a caveman could do it" (per a certain set of insurance company commercials), I actually was able to hear a broadcast through the ear bud from the local AM radio station (WNAV in Annapolis, Maryland). It would be a couple more years - probably because I had not heard of them until then - before I was able to buy a Heathkit multimeter kit. The rest, as they, is history. A precision source of sine or square waves at a low kit price ... that's the new solid-state IG-18 from Heath. Delivers 5% accuracy thru the wide range of 1 Hz to 100 kHz. The sine wave section features less than 0.1 % distortion thru the audio range, 8 output voltage ranges from 0.003 to 10V, switch-selected internal 600 ohm load or external load and metered output of both voltage & dB. The square wave section has a 50 ns rise time and three output voltage ranges from 0.1 to 10 V P-P. Both sine & square waves are available simultaneously and the frequency is switch-selected for constant repeatability and fast operation. Circuit board construction makes the new IG-18 easy to build ... new Heathkit styling and engineering excellence make it easy to use. Put the new IG-18 on your bench now. 10 lbs. The new Heathkit IM-18 continues the features that made the IM-11 famous ... 7 AC and 7 DC voltage ranges that measure from 0-1500 volts full scale ... 7 ohms ranges for measurements from 0.1 ohm to 1000 megohms ... the convenience of a single probe ... 11 megohm input impedance ... ± I dB 25 Hz to 1 MHz response ... precision 1% resistors ... DC polarity reversing position on the function switch ... RMS & P-P AC voltage and dB measurement capability ... precision 4 1/2", 200 uA meter for extra sensitivity. In addition, the new IM-18 has 120 V. or 240 V. AC wiring options, new Heathkit styling and a 3-wire line cord for safety. 5 lbs. The Heathkit IM-13 has the same performance specifications as the new IM-18 above, but it also incorporates other features that put it in a class by itself, such as a large, easy-to-read 6" meter ... extra 1.5 and 5 volt AC ranges for additional accuracy ... convenient gimbal mounting that allows attachment to your most convenient surface ... "Set and Forget" calibration - all controls are adjustable from the front panel with a screwdriver ... smooth ten-turn vernier control of Zero and Ohms adjust for greater accuracy and easier setting ... clean, open parts layout and a readily accessible "ohms" battery. Assembly is easy, thanks to the famous Heathkit manual, and operating convenience and versatility are tops. For maximum value in a general service VTVM, you just can't beat the Heathkit IM-13. 7 lbs. For all around general service work, audio design or laboratory analysis, there isn't a better value than the new Heathkit IM-38 AC VTVM. Here's why - 10 voltage ranges measure from 0.01 to 300 volts RMS full scale ... extended frequency response of 10 Hz to 500 kHz at ±1 dB ... 10 megohm input on all ranges for higher accuracy ... wide -52 to +52 dB range ... VU-type ballistic meter damping ... very low AC noise ... 120 or 240 VAC wiring options and new Heathkit styling in sharp beige & brown with an easy-to-grasp, easy-to-read knob. 5 lbs. If you work with transistors, this is the power supply for you. All solid-state circuitry provides 1-15 VDC at up to 500 mA continuous. Features adjustable current limiting, voltage regulation, floating output for either + or - ground, AC or DC programming, circuit board construction, and small, compact size. 110 or 220 VAC. 5 lbs. In-Circuit transistor testers don't have to be expensive, and the IT-18 is proof of that · ... tests DC Beta 2-1000, in or out-of-circuit ... leakage Icbo and Iceo current 0-5000 uA out-of-circuit ... identifies NPN or PNP devices ... tests diodes in or out-of-circuit for opens & shorts ... identifies unknown diode leads ... matches PNP & NPN transistors. The IT-18 is completely portable - runs on just one "D" cell. Easy to use too ... rugged polypropylene case, attached 3' test leads, big 4 1/2" 200 uA meter, all front panel controls, 10-turn calibrate control. 4lbs. Another very popular volt-ohmmeter from Heathkit engineering and it's easy to see why - all solid-state circuitry ... high impedance FET input, 11 megohms on DC, 1 megohm on AC ... 4 AC voltage ranges ... 4 DC voltage ranges ... 4 ohm ranges · .. 4 1/2" 200 uA meter ... 3 built-in test leads ... DC polarity reversing switch ... zero-adjust & ohms-adjust controls ... continuous 12-position function switch. And that's not all - the IM-17 is battery powered for complete portability and comes in a rugged polypropylene case with built-in handle. Simple circuit board assembly. 4 lbs. The new IG-57 plus a 'scope is all you need ... no external sweep generator required. Switch selection of any of 15 crystal-controlled marker frequencies (you can view up to six different frequencies on one 'scope trace). Select the sweep range and you are ready to instantly see the results of any changes you make. Four markers. for setting color bandpass, one for TV sound, eight at IF frequencies between 39.75 & 47.25 MHz plus picture and sound carrier markers for channels 4 & 10. Three sweep oscillators produce the 5 most-used ranges ... color bandpass, FM IF, color & B&W IF and VHF channels 4 & 10. Save hundreds of dollars and put full alignment facilities in your shop too - order your IG-57 now. 14 lbs. Kit IG-14, same as IG-57 w/o the sweep, 11 lbs. $99.95. The New Heathkit IO-18 is destined to be the world's most popular 'scope, just as its predecessor, the 10-12 was. Features 5 MHz bandwidth, the famous Heath patented sweep circuit - 10 Hz to 500 kHz in 5 ranges, two extra sweep positions which can be preset to often-used rates, frequency compensated vertical attenuation, built-in pop calibration reference, Z-axis input, retrace blanking, wiring options for 120 or 240 VAC operation and new Heathkit styling in beige and brown. 24 lbs. The new Heathkit GR-681 is the most advanced color TV on the market. A strong claim, but easy to prove. Compare the "681" against every other TV - there isn't one available for any price that has all these features. Automatic Fine Tuning on all 83 channels ... just push a button and the factory assembled solid-state circuit takes over to automatically tune the best color picture in the industry. Push another front-panel button and the VHF channel selector rotates until you reach the desired station, automatically. Built-in cable-type remote control that allows you to turn the "681" on and off and change VHF channels without moving from your chair. Or add the optional GRA-681-6 Wireless Remote Control described below. A bridge-type low voltage power supply for superior regulation; high & low AC taps are provided to insure that the picture transmitted exactly fits the "681" screen. Automatic degaussing, 2-speed transistor UHF tuner, hi-fi sound output, two VHF antenna inputs ... plus the built-in self-servicing aids that are standard on all Heathkit color TV's but can't be bought on any other set for any price ... plus all the features of the famous "295" below. Compare the "681" against the others ... and be convinced. Big, Bold, Beautiful ... and packed with features. Top quality American brand color tube with 295 sq. in. viewing area ... new improved phosphors and low voltage supply with boosted B + for brighter, livelier color ... automatic de­gaussing ... exclusive Heath Magna-Shield ... Automatic Color Control & Automatic Gain Control for color purity, and flutter-free pictures under all conditions ... preassembled IF strip with 3 stages instead of the usual two ... deluxe VHF tuner with "memory" fine tuning ... three-way installation - wall, custom or any of the beautiful Heath factory assembled cabinets. Add to that the unique Heathkit self-servicing features like the built-in dot generator and full color photos in the comprehensive manual that let you set-up, converge and maintain the best color picture at all times, and can save you up to $200 over the life of your set in service calls. For the best color picture around, order your "295" now. Has same high performance features and built-in servicing facilities as the GR-295, except for 227 sq. inch viewing area. The vertical swing-out chassis makes for fast, easy servicing and installation. The dynamic convergence control board can be placed so that it is easily accessible anytime you wish to "touch-up" the picture. Same high performance features and exclusive self-servicing facilities as the GR-295 except for 180 sq. inch viewing area. 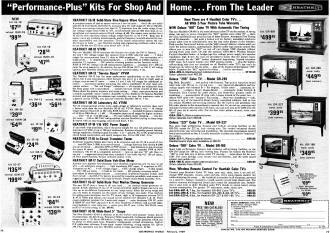 Feature for feature the Heathkit "180" is your best buy in deluxe color TV viewing ... tubes alone list for over $245. For extra savings, extra beauty and convenience, add the table model cabinet and mobile cart. Control your Heathkit Color TV from your easy chair, turn it on and off, change VHF channels, volume, color and tint, all by sonic remote control. No cables cluttering the room ... the handheld transmitter is all electronic, powered by a small 9 v. battery, housed in a small, smartly styled beige plastic case. The receiver contains an integrated circuit and a meter for adjustment ease. Installation is easy even in older Heathkit color TV's thanks to circuit board wiring harness construction. For greater TV enjoyment, order yours now. Now with more kits, more color. Fully describes these along with over 300 kits for stereo/hi-fi, color TV, electronic organs, electric guitar & amplifier, amateur radio, marine, educational, CB, home & hobby. Mail coupon or write Heath company, Benton Harbor, Michigan 49022.